Easter is a time for replenishment and renewal, new beginnings and gratefulness. Stores are lined with flowers, pastels, every variety of marshmallow animals, and your favorite chocolate bar reshaped into egg form. The vast array of plastic eggs is also quite impressive. One year, Raff and I were invited to attend a large Easter egg hunt hosted by a local church. However, it was pouring outside when it came time for the hunt. The organizers of the event decided it would still go on but be moved indoors. Volunteers were asked to help hide eggs around the building and instructed about where to hide or not hide them. The kids were moved to the sanctuary and every attempt was made to keep them occupied while the eggs were being hidden. But the children were so excited about the impending treasure hunt that the large room was at a raucous. Excitement thrummed through the air. After keeping about 50 children entertained for what seemed like an hour, but in reality was only about 30 minutes, a tall woman with an orange cone-shaped megaphone announced “please line up by the door for the egg hunt!” The children immediately did as they were told, Easter baskets were passed out to everyone, and the room fell quiet while everyone waited with bated breath for the signal. The heavy wooden double doors of the sanctuary were opened and the children burst out of the room like a coke bottle that had been shaken before being uncapped. I tried to keep up with Raff, but lost sight of him in the melee. Children were running and squealing with delight as they found eggs and placed them in their baskets. It was pure pandemonium but such a joyous cacophony. I rounded the corner in my search for Raff and found him standing next to an elderly man in a wheelchair. The pair looked as if they were discussing something very important. As I approached them, I saw that Raff’s basket was filled to the brim with eggs. “I see you found a lot of eggs. High-five, buddy!” I said as Raff and I slapped our hands together. “Yeah, I think I found enough, I was going to let the other kids find the rest. Plus I’ll get way more candy at MeMe and PapPaw’s house later,” he said with a very obvious wink. I tousled his hair and then held out my hand to the man in the wheelchair. “Hello, I’m Raff’s mom, Sarah,” I said as we shook hands. “Nice to meet you, my name is Stanley,” he said. “This nice young man helped me get over the door threshold over there in the floor. I couldn’t get my wheels over it and he came to help and pushed me over it. And I gave him a piece of candy. I bought a lot of Easter candy to donate to the church to be put into the eggs and had forgotten about it. So I just decided to bring it anyway and pass it out. I can’t eat candy anymore with these things.” He flashed a wide smile to show his dentures. “Well that was very kind of you Mr. Stanley,” I said. “Go ahead and open up that candy and tell me what you think. That used to be one of my favorites when I was young,” Mr. Stanley said. 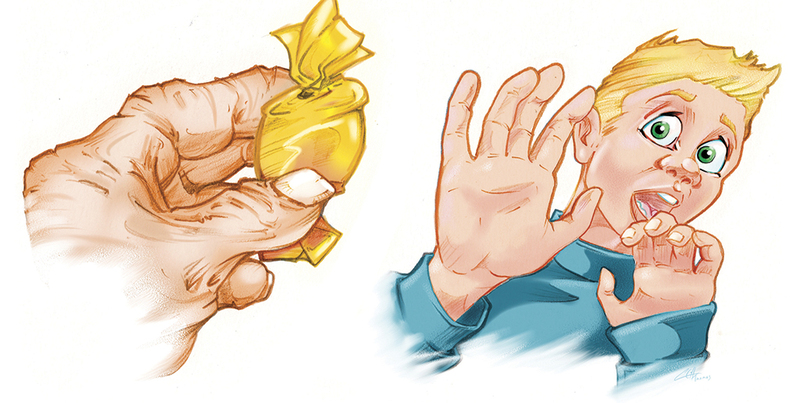 Raff reached into his pocket and pulled out a gold foil wrapped candy and opened it. I saw Raff make a weird face as he said “It looks kind of —“ I cut him off with a loud clearing of my throat. Raff looked up at me annoyed. He popped the candy in his mouth and began to chew it. His eyes got wide and he stopped chewing and I could tell he was wanting to spit it out. “Well what do you think? It’s good, huh?” Mr. Stanley said. Raff looked up at me helplessly. My eyes widened and I raised one eyebrow and pursed my lips. Raff shook his head slightly and I leaned over and discreetly pinched the back of his arm. He chewed quickly and swallowed the candy. “Well Mr Stanley, it was nice to meet you, but we have to get going. And thank you, again, for the candy.” We waved goodbye and I took Raff’s hand and lead him to the bathroom. If I remembered correctly, there was a water fountain near the bathrooms. We rounded the corner and nearly bumped into a woman. “Oh I’m sorry, excuse us,” I said. “Oh you’re fine, I was walking too fast anyway. I’ve got to find my father. Have you seen an older man in a wheelchair thas a sack of candy with him? Last week he found that sack of candies in his closet that he had bought when he found out that his favorite candy was not going to be made anymore so he bought tons of it. He wanted to bring it to pass out to the children, but I wouldn’t let him. But that ol’ stinker sneaked them anyway. I only refused to let him because that bag of candy has to be 10-15 years old! I can’t imagine what they would taste like,” she said. I suddenly began to feel really bad for Raff. I pointed in the direction in which we had come. “I think we saw him down that hallway,” I said. “Thanks!” The woman said and walked away. “See mom! I wanted to spit it out but no! You made me eat 15-year-old candy! I’m probably poisoned!” Raff hissed. I rolled my eyes. “You’re not poisoned, but I am sorry. But still. He wanted to you to like that candy as much as he did. He would have been so sad if you had spit it out,” I said. “I know, but it was awful. And what happened to the whole ‘never take candy from strangers’ rule?’” Raff asked. “Yeah that’s a good one. I’ll try to remember that if we see Mr. Stanley again so that I won’t have to eat his old candy,” I said to Raff with a grin.